Valve has added the ability to refund pre-orders for unreleased titles. The next time the siren song of a pre-order bonus on Steam turns sour, you can get a refund for your pre-purchase and put that cash towards a different game. A recently added option now allows Steam users to cancel pre-orders of unreleased titles and receive a refund. Only purchased items that have not been released, gifted, or traded away can be refunded. The value of the refund is applied to your Steam wallet balance. The new feature was noticed by Steam user donham on January 23. 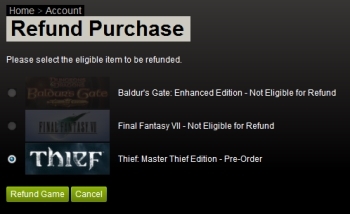 To refund a game, go to your Steam account page and click on store transactions. On the list of recent Steam Store transactions for your account, any game that is eligible for a refund will include a "Refund an item" link. For transactions that included multiple games, clicking on the link for that transaction will take you to a page where you can select the game eligible for the refund. You complete the refund completely on your own, with no need to contact Valve. Once a game is released, Steam does not offer any refunds or exchanges on games, DLC, or in-game items. Other online gaming retailers have also been adding refund options. In December, DRM-free games retailer GOG announced its new guaranteed refund policy. Under the new policy, customers can return any game that doesn't work properly on their system for a full refund within 30 days of purchase. GOG also instituted a 14-day refund policy for any purchase. To take advantage of either policy, customers must contact GOG customer support. However you feel about pre-orders, this new refund option seems like nothing but good news for gamers.